University of Chicago Press, 9780226214320, 386pp. The Victorian period in Britain was an “age of reform.” It is therefore not surprising that two of the era’s most eminent intellects described themselves as reformers. Both William Whewell and John Stuart Mill believed that by reforming philosophy—including the philosophy of science—they could effect social and political change. But their divergent visions of this societal transformation led to a sustained and spirited controversy that covered morality, politics, science, and economics. Situating their debate within the larger context of Victorian society and its concerns, Reforming Philosophy shows how two very different men captured the intellectual spirit of the day and engaged the attention of other scientists and philosophers, including the young Charles Darwin. Mill—philosopher, political economist, and Parliamentarian—remains a canonical author of Anglo-American philosophy, while Whewell—Anglican cleric, scientist, and educator—is now often overlooked, though in his day he was renowned as an authority on science. Placing their teachings in their proper intellectual, cultural, and argumentative spheres, Laura Snyder revises the standard views of these two important Victorian figures, showing that both men’s concerns remain relevant today. A philosophically and historically sensitive account of the engagement of the major protagonists of Victorian British philosophy, Reforming Philosophy is the first book-length examination of the dispute between Mill and Whewell in its entirety. A rich and nuanced understanding of the intellectual spirit of Victorian Britain, it will be welcomed by philosophers and historians of science, scholars of Victorian studies, and students of the history of philosophy and political economy. Laura J. Snyder is a Fulbright Scholar, professor of philosophy at St. John’s University in New York City, and past president of the International Society for the History of Philosophy of Science (HOPOS). She is also the author of The Philosophical Breakfast Club: Four Remarkable Friends Who Transformed Science and Changed the World, which was a Scientific American Notable Book, an Official Selection of the TED Book Club, and winner of the 2011 Royal Institute of Australia poll for Most Popular Science Book. "In this impressive study of two major Victorian intellectuals, Snyder displays both analytical acumen and historical sensitivity; she has written a book that will be read with profit and pleasure by anyone interested in the history of moral, political, and philosophical reflection on science." "This is the definitive work and must be on the shelves of any library with pretensions to completeness about the [Victorian] age." 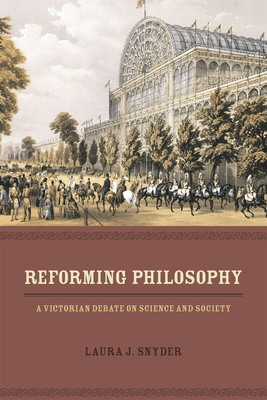 "Snyder's impressive achievement is not only to register a significant improvement in our understanding of the technicalities of this debate over the proper method of scientific reasoning, but also to bring the debate alive in a way that illuminates the whole terrain of mid-Victorian intellectual life." "Snyder's careful recovery of a process of knowledge-production through dialogue is compelling. . . . For those who want to understand Mill or Whewell, Snyder's is an indispensable study." "Snyder's great strength is in elaborating and refining our understanding of Whewell, but she does us an additional important service by situating the technical debates between Mill and Whewell in their political and social circumstances. . . . A strong contribution not only to a better understanding of 19th-century British philosophy of science, but of the intellectual foundations of that broader institutional reform as well." "The scholarship is everywhere evident, both in the history and in the way it relates, in often illuminating fashion, this older debate to more recent discussions, especially in ethics and in the philosophy of science." "Tracing the intellectual origins of how two men came to understand the needs for Victorian reform is, without question, a worthwhile and interesting examination for the more traditional political or social historian." "The remarkable amount of contextual detail presented will render this volume indispensable to scholars of the history of the philosophy of science. . . . In this sophisticated and elegant intellectual history, Snyder effectively communicates complex ideas and rejuvenates Whewell's philosophical legacy."